seit nun sechs Jahren liefert euch das Azure Community Deutschland Informationsportal, das Neues aus der Azure Welt. Mit inzwischen fast 1800 Artikeln, sind wir dabei zum richtigen Vielschreiber geworden. Für mich stellt sich nun die Frage: Gibt es eine Weiterentwicklung? 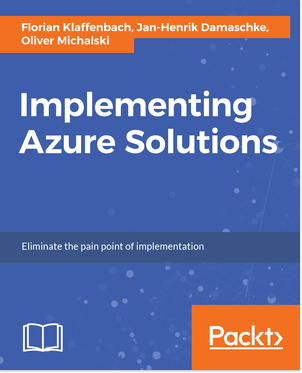 Chapter 1, Getting Started with Azure Implementation, … Within that chapter the reader will get an overview about Cloud service models, Cloud deployment models, Cloud characteristics, and Azure services. Chapter 2, Azure Resource Manager and Tools, … Within that chapter the reader will learn all about the Azure Resource Manager and his concepts (Azure Resource Groups/ Azure Resource Tags/ Locks), The reader will also get an introduction in the working with ARM Templates area. Chapter 3, Deploying and Synchronizing Azure Active Directory, … Within that chapter the reader will get an overview about the deployment, management and functionalities of Azure Active Directory and its relation to a Microsoft Azure Subscription. Chapter 4, Implementing Azure Networks, … Within that chapter the reader will learn how networking in Azure works, how to plan Azure network components and how to deploy the different network components within Azure. Chapter 5, Implementing and Securing Storage Accounts, … Within that chapter the reader will learn all about Azure Storage Management and his concepts (Blob / Table / Queue / File). The reader will also get some basic storage configurations. Chapter 6, Planning and Deploying Virtual Machines in Azure, … Within that chapter the reader will learn the difference between the Azure Virtual Machine types, the common use cases for the different types and how to deploy Virtual Machines. Chapter 7, Implementing Cloud Services, … Within that chapter the reader will learn all about Azure Cloud Services, the Cloud Service architecture, Azure Cloud Service vs. Azure App Services and how to create your first Cloud Service. Chapter 8, Exploring and Implementing Containers, … Within that chapter the reader will learn the basic knowledge about the Azure Container Service area and how to create your first container service. The reader also learns the necessary steps for working with the service afterwards. Chapter 9, Securing an Azure Environment, … Within that chapter the reader will learn all about Azure Security concepts (Identity Management with Azure AD / Role based Access Control / Azure Storage security) and the Azure Security Center. Chapter 10, Best Practices, … Based on a common use case and migration scenario, the reader will get a basic overview how classic applications and services can be placed in the Microsoft Cloud ecosystem and which tools can be used for the migration. Ihr habt Interesse an diesem Buch?